The Royal ship Vasa - the Vasa museum, Stockholm, Sweden. Vasa is Stockholm's most visited attraction. And it's not so strange for the Royal Warship Vasa is the only preserved wooden ship of its kind worldwide. It has also given us modern people a great insight on how people lived in Stockholm during the 1600s because so much was preserved when it came up from the depths after over 300 years in the water. In 1611 Gustav Adolf the Second took over the Swedish throne. Sweden was in this time a country with great power and participated in several wars against Russia, Poland and Denmark. Here in Sweden, new towns were built such as Gothenburg. The king wanted to show his power and Sweden's warrior spirit with a large and majestic warship. The idea was to use the Vasa in the ongoing wars that ravaged. Since 1625, Sweden was at war with Poland and the 30-year war was continuing in Germany. They also wanted to show Denmark that Sweden was as good as they at sea. 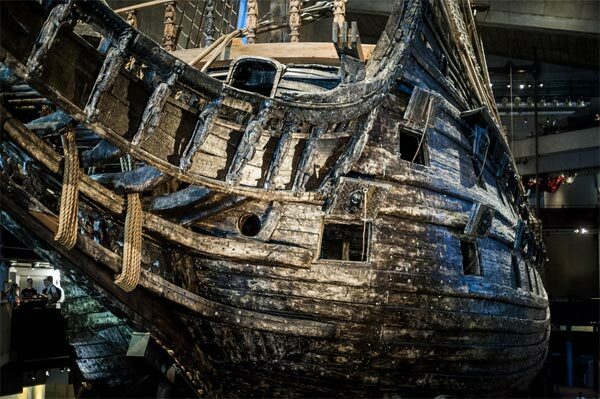 In 1625 the warship Vasa begun to be built out on Skeppsholmen shipyard todays Blasieholmen. Henry Hybertsson was the ship builder but he would never see the Vasa completed because he became ill and died in the spring 1627. During this time, when the Vasa was built, the entire Stockholm city were involved in the construction and everything that would be taken on board. It is said that all the bakers in Stockholm, worked day and night to bake bread that would be taken on the journey. Eventually it went so far that they could not cope anymore and rebelled in the Main Square in todays Old Town. This was not popular, and to show example they beheaded the man who started the rebellion. Many women worked in candle making and made clothes etc. 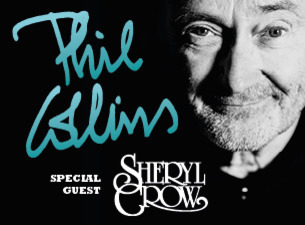 A priceworthy combo tour. 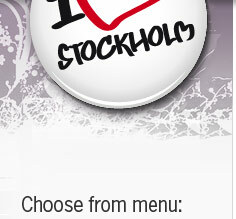 You start in the Old Town (Gamla Stan) with a walking tour (approx 2 hours). After this you head to the docks to get on a boat to Djurgården and get to know the suroundings. Then you head inside the world famous Vasa museum where you can walk around in your own pace. It was a fine day August 10, 1628 when Vasa set sail on its maiden voyage through the Stockholm harbor. The cannon doors were open and they fired salute when they started leaving Stockholm harbor. On the ship was the captain and all his shipmen but also the wives of some, when it was customary that they were allowed to sail with during the first part. Although there was barely any wind that day it came a few gusts that made the Vasa start to lurch. Eventually she tilted so hard that the open cannon gaps began to take in water. Then everything went very quickly, when water began to gush into the gun deck, the men did not have a chance to either get the water out or get Vasa on an even keel, the only thing they could do was to try to save themselves. Vasa sank to a depth of 32 meter which made the masts viewable above water. 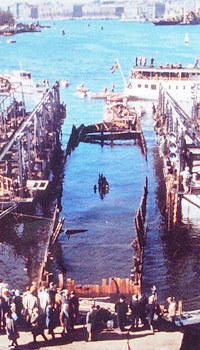 Although it was close to shore and several small boats out there who came to rescue, about 50 people drowned that day. Although they started to try to pick up Vasa just days after the accident, it was not possible to salvage the Vasa and its contents. 30 years later in 1664 an attempt was made to pic up Vasa's cannons, but they were only able to fetch two of the more than 50 cannons on board. Not until about 300 years later in 1956 Vasa was found again on the ocean bottom. It was Anders Franzén and diver Per Edvin Fälting who found Vasa, after about 2 years of searching. The wreck turned out to be almost intact but obviously some parts had been destroyed due to the sinking and all the years in the ocean and previous salvage attempts. 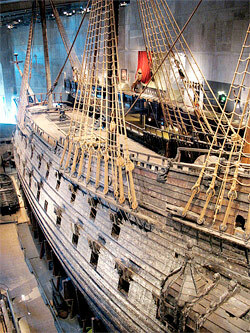 But despite this Vasa was well preserved. This is because the Baltic Sea is brackish and lacks the devastating shipworm found in warmer and saltier water. Although Vasa was found five years earlier, it was a lot of work to get Vasa out of the water. A lot of renovations were done under water when the Vasa would otherwise never been able to be salvaged. So the time was come, at. 9:03 April 24, 1961 Vasa broke the surface. It must have been an amazing sight for all those gathered to witness this. And there were many who were curious, both Swedish and foreign press and TV were in place. Now the time-consuming work to preserve Vasa begun. For 17 years they sprayed Vasa with a chemical solution that would replace the water that Vasa was full of. On June 15, 1990 the Vasa museum officially opened by King Carl XVI Gustaf. The museum has since been visited by millions of visitors from all corners of the world. According to experts, unfortunately Vasa will not remain forever when she breaks down. But we hope she remains for a loooong time. 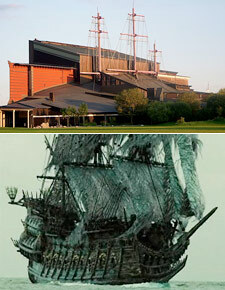 The Vasa ship is said to have inspired the creators of the ship "The Flying Dutchman" in the Pirates of the Caribbean movies. Hotels near the Vasa Museum!